Ranilson Supplies delivers 3D Modeling services to multi-disciplinary engineering fields such as Piping, Mechanical, Civil, Structural, Electrical and Instrumentation. We provide 3D design services to customers in industries such as Oil & Gas, Steel, Process industries like Petrochemical, Pharmaceutical, Fertilizer and Utilities such as Water & Effluent Treatment and Power. Our team of Designers and Modelers are competent in utilizing latest 3D modeling software for each level of project design development – from concept to accurate designs and right through to the documentation for Fabrication/Construction. 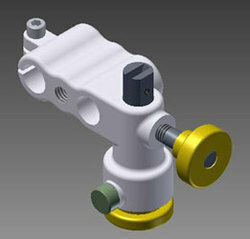 3-D Technical Services works closely with designers and engineers to accelerate the product development process. We can produce design concept sketches, hand fabricated foam study models or sculpted clay masters which can then be laser scanned to create the CAD files. The files can then be further refined and more detailed prototypes can be produced. We also can create CAD data from verbal direction or sketches and, produce a detailed prototype.We are experts in the design, development, validation and manufacture of Specialty Machines.